Trader Joe’s is a place I shop frequently and sometimes spend too much money, but I always find something new there that I would like to try. When the popular store opened in my little hometown, I quickly found some favorite frozen items that I can grab at anytime and make something from them. 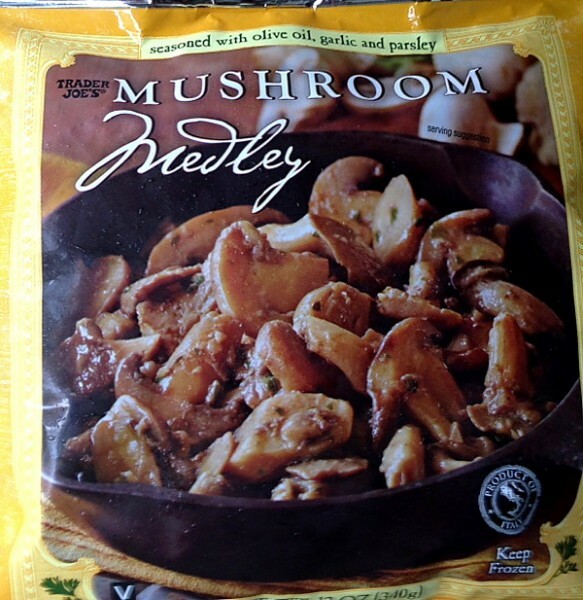 I love mushrooms, and when I discovered the 12 ounce package of Mushroom Medley, I knew it was something I would use over and over. I always prefer fresh mushrooms, but there are times when I don’t have them and can’t make it to the store. This is when I grab my trusty bag of mushroom medley. This happened over the weekend when I wanted to have some mushrooms with a roast beef for dinner. When the roast was done and resting for ten minutes before slicing, I got out the mushroom medley and had something ready in minutes. All I needed was some onion, garlic, thyme, and a little red wine. Done. The mushroom medley goes from freezer to pan; no need to even thaw. The result was delicious. Just add some garlic mashed potatoes, and maybe an apple pie or tart for dessert, and a beautiful autumn dinner is served. Now wasn’t that easy? Preheat oven to 325 degrees. Spray a rack with nonstick spray and place in a roasting pan. Season the beef with the salt and pepper. Roast beef for 1 hour, or until it reaches your desired doneness. Transfer roast to a cutting board and let stand for 10 minutes. When roast is resting, prepare mushrooms. Heat the olive oil in a skillet. Saute the onion until softened. Add the garlic and frozen bag of mushrooms. Saute, stirring constantly, for another 5 minutes. Stir in the wine and thyme and cook, stirring constantly, until the mushrooms are softened, about 5-6 minutes. 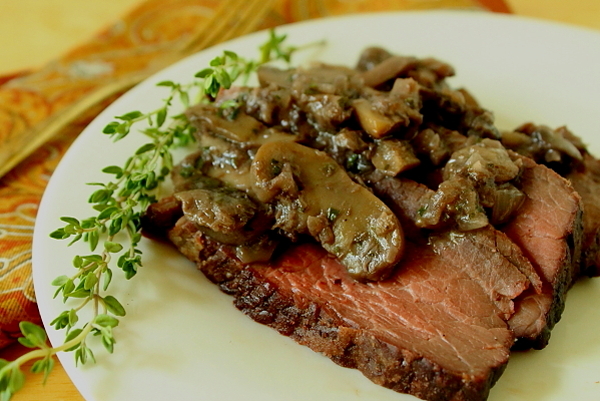 Slice the beef and serve with some mushrooms spooned over the top. Serve immediately. Serves 6-8. *If you can't find the bag of mushroom medley at your Trader Joe's, or you don't have a Trader Joe's nearby, you can substitute about 3 cups of fresh mushrooms, preferably a mix of shiitake, cremini, and porcini, or your favorites. I’m putting mushroom medley on my shopping list for my next trip to Trader Joe’s. I have to try that recipe. And you’re right. Apple tart is the perfect dessert for a roast beef dinner.